Need it customized? After you place your order, simply go to our Customize It! page and fill out the form. 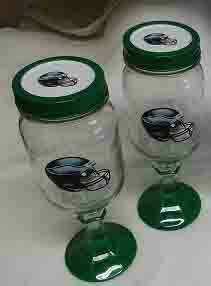 There you can specify team names for any sports item or any other customization you need. 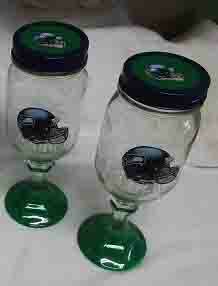 Celebrate your sports favorites with these custom Redneck Wine Glasses! Any sports teams you want – we’ll create ’em! 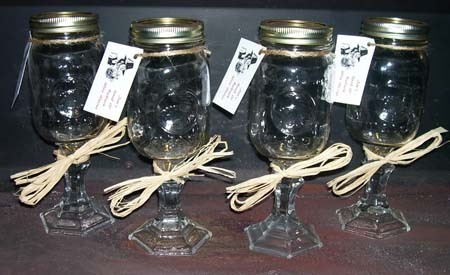 These here redneck wine glasses make the perfect gifts for the wine connoisseur kinfolk who thinks they’s gottin everything! Load up these sweet gems with your favorite wine or moonshine, set yourself in front of the fire and enjoy. And don’t y’all go worryin’ ’bout spillin’ nuthin’ outcha glasses neither. We keep those mason jar lids on ’em just for you! 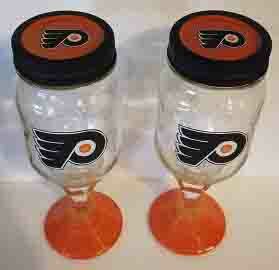 These glasses is sure to make great conversation for your kin and friends when they come a-visitin’! We even put little gen-u-ine bullets in the stems of our plain Redneck Wine Glasses! Needin’ to see bigger pictures? Jes click on them there photos below and thems pictures o’ those redneck wine glasses will get a whole lot bigger fer ya. Order yours today and we’ll ship ’em right out to ya! 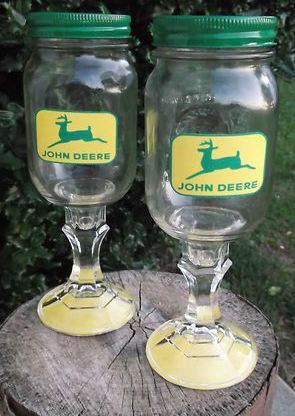 If you own a gift shop and are interested in selling some of these fancy redneck wine glasses in your store, give us a call to discuss options for purchasing some of our items wholesale for resale.